Behold some socially conscious subtext for possible classic reboots. On March 29, Disney released its live-action/CGI remake of its 1941 classic Dumbo—and there weren’t exactly lines around the block waiting to get in. Opening weekend box-office was around $45 million, falling disappointingly short of projections that estimated between $50 and $60 million. Like many of Disney’s recent successful revivals of existing brands, Dumbo tried to beef up the familiar storyline with an attempt at including “relevant” contemporary issues, including the plight of circus animals and the need for STEM education for girls. But with high-profile new versions of Aladdin and The Lion King already on the way in 2019, and others like Mulan and Lady and the Tramp in the works, maybe the Mouse House needs some suggestions on how to goose audience interest with socially conscious subtext. “Might you have some suggestions for how this pop-culture juggernaut should conduct its business?” you might ask. Why yes, we do! Here are a few ideas for how Disney might take some of the still-untapped intellectual property in its animated vault and give it that ol’ 2019 spin. 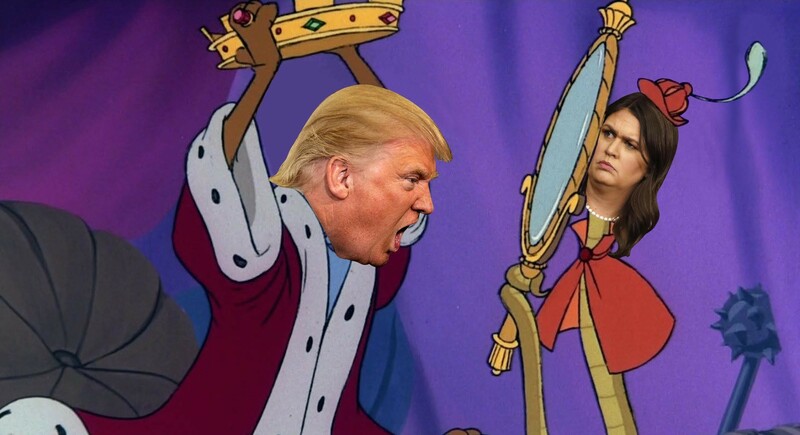 Robin Hood: Updated for the age of Trump, it’s set in a country ruled by Prince John, a greedy, insecure, infantile leader who has taken control through duplicitous means. Portrayed as a lion with a comb-over mane (voiced by Alec Baldwin), and with the snake Sarah Hissabee at his side, he faces the challenge of a heroic fox who promises to take from the rich and give to the poor (voiced by Alexandria Ocasio-Cortez) after the people get no help from the report by Independent Cow-nsel Robert Moo-ler. The Fox (News) and the Hound: Two young animals grow up as close friends without realizing that they are meant to be natural enemies, because one comes from a Republican family, and the other from a Democratic family. There is a chance for them to become friends again as adults, but both of them get Facebook accounts, and then there can be no happy ending. The Black Cauldron: An evil Horned King attempts to control the land of Prydain by means of a magical cauldron that is constantly filled with donations from corporate lobbyists and Super-PACs. The lowly pig-keeper Taran and his friends try to defeat the villain with a grass-roots effort at passing a constitutional amendment to overturn the Prydainians United court decision. The Three Caballeros: Donald Duck flies into a rage upon discovering that José and Panchito are stealing the jobs of American animated birds. Yet through the power of multi-cultural music and dance, they eventually come to a mutual understanding, until Donald is accused of cultural appropriation for wearing a sombrero. The Great Mouse Detective: In a steampunk version of present-day England, Basil of Baker Street is made aware of a plot by the evil Ratigan to create an easily-manipulated facsimile of a ruler, so that he can convince the British to take absurd and self-destructive actions. Everyone eventually learns the truth of Ratigan’s trickery, but somehow nobody can agree on a plan to prevent the worst consequences, and Ratigan ultimately triumphs through sheer pig-headed national stupidity. Bambi: As a result of climate change, Bambi’s forest is still on fire, all the time, and the NRA offers thoughts and prayers regarding the shooting of every last one of his friends. Song of the South: Nope, not touching that one. Nooooo way. SLC celebrates first Indigenous Peoples Day.